This moist banana bread is made with peanut butter powder, chopped peanuts, mashed ripe bananas, and mini semisweet chocolate chips. The peanut butter powder adds a light peanut butter flavor to the banana bread. This recipe uses mini chocolate chips along with the chopped peanuts. The chopped peanuts add more peanut flavor and texture but chopped pecans or chopped walnuts may be substituted. Grease and flour a 9-by-5-by-3-inch loaf pan. Heat the oven to 325 F / 165 C / Gas 3. In a mixing bowl with an electric mixer, cream the softened butter and granulated sugar until light and fluffy. Add the eggs, one at a time, beating well after each addition. Beat in the vanilla extract and milk. Sift dry ingredients together; add to creamed mixture and beat on low speed just until blended. Fold in the mini chocolate chips and chopped roasted peanuts. Pour the batter into the prepared loaf pan; bake the loaf for about 1 hour and 10 minutes to 1 hour and 20 minutes, or until a toothpick inserted in center comes out clean. Store the bread covered or in a food storage bag at room temperature for up to 2 days or store for up to 1 week in the refrigerator. For longer storage, freeze the banana bread. Substitute raisins or toffee chips for the mini chocolate chips. Replace half or all of the granulated sugar with packed brown sugar, light or dark. Drizzle a simple chocolate glaze over the cooled bread. Combine 1/2 cup of semisweet chocolate chips, 1 1/2 tablespoons of butter, and 1 tablespoon of corn syrup in a saucepan over low heat. Cook, stirring, until the chocolate has melted and the mixture is smooth. 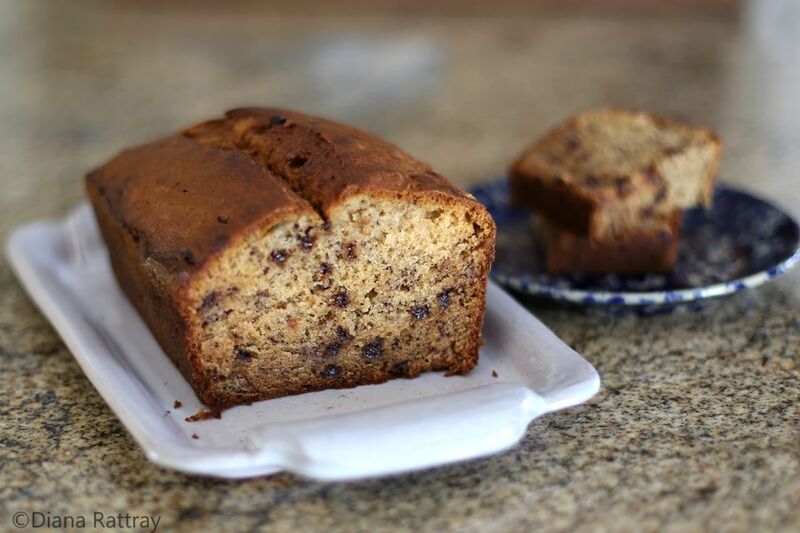 Stir in a few drops of vanilla extract, if desired, and drizzle over the banana bread.